The Union of Arab National Olympic Committees (UANOC) yesterday (Thursday) agreed to provide the Supreme Organising Committee of the Arab Women’s Sport Tournament (AWST) with sponsorship, advertising, marketing, TV broadcasting and proceeds rights of the fourth edition of AWST taking place from February 2 - 12, next year.The event will be held under the patronage of Her Highness Sheikha Jawaher bint Muhammad Al Qasimi, wife of His Highness the Ruler of Sharjah and Chairperson of the Supreme Council for Family Affairs and Sharjah Women’s Sport Foundation (SWSF).Signatories of the agreement comprised His Royal Highness Prince Talal bin Abdulaziz, Chairperson of the Arab Sports Council and Chairperson of UANOC, Sheikh Khalid bin Ahmed bin Sultan Al Qasimi, Head of the AWST Senior Organising Committee, Sheikha Hayat bint Abdulaziz Al Khalifa, Head of the AWST Supervisory Committee, Saud bin Abdulaziz, Secretary-General of UANOC, Nada Askar Al Naqbi, Head of the AWST Executive Committee and Director General of SWSF, as well as a host of officials who attended the signing.During a high level meeting at Sharjah Ladies Club to announce the agreement, members of the organising councils unveiled the increasing numbers of participants from 15 Arab nations, where increasing numbers of participations were taking place across all of AWST’s 9 sports games. After signing the agreement, the Senior Organising Committee delegation led by Sheikh Khalid bin Ahmed bin Sultan Al Qasimi and the UANOC delegation headed by HRH Prince Talal bin Abdulaziz, in the presence of Sheikha Hayat bint Abdulaziz Al Khalifa toured the Sharjah Ladies Club, which will host many of AWST’s competitions, and evaluated the readiness of its facilities. 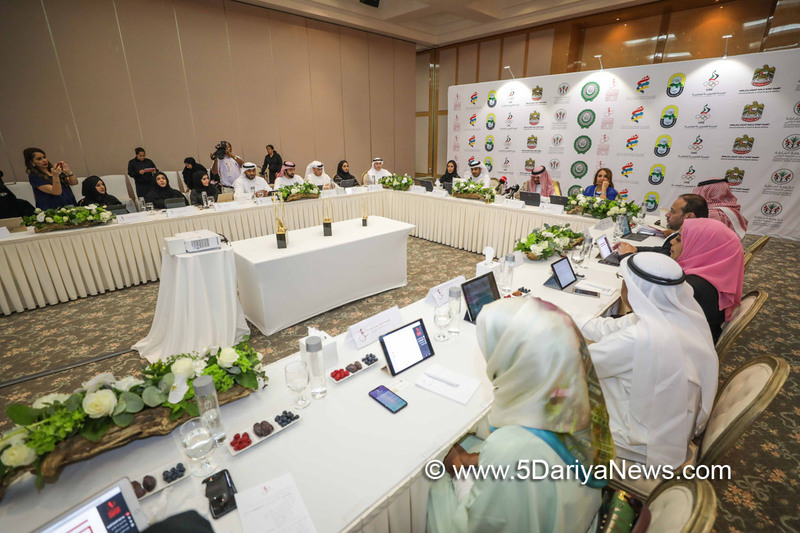 Nada Askar Al Naqbi highlighted that the fourth edition of AWST will see karate as the official ninth sport at AWST, having added show jumping in 2016. She pointed out that AWST is seeing a remarkable development in terms of the number of competitors and countries, in keeping with its mission to become a fully integrated global event.She noted that the fourth edition of AWST is anticipated to see fierce competition, pointing out that its supreme objectives are to not only elevate women in sports, but also stimulate joint Arab cooperation to empower women in all fields.AWST 2018 will feature nine sports, namely; basketball, volleyball, table tennis, fencing, archery, shooting, athletics, show jumping and karate.